The beautiful mountains and sunny skies of Colorado attract outdoor enthusiasts from all over the country. In the past ten years or so, Colorado has experienced quite the influx of residents. If you’ve never lived in a high altitude before, it can wreak havoc on your skin. Higher altitudes mean increased UV exposure, which can damage your skin and even cause skin cancer if you are not properly protected. Our climate also includes low humidity levels, which can leave your skin feeling dry, flaky, and more sensitive. In the winter, humidity levels drop further right along with the temperatures, and keeping your skin properly moisturized may feel downright impossible. Our Boulder dermatology clinic is happy to provide you with some guidelines for taking care of your skin in our unique climate. It’s quite common for people to be informed to drink plenty of fluids in higher altitudes to hydrate their bodies. In addition to drinking a lot of water, you also need to properly hydrate your skin, which could be more involved than simply applying a lotion to your face. After washing your face, use a hydrating toner followed with a moisturizing serum. Once the serum is applied, add a facial moisturizer such as a cream, lotion, or oil for your skin to absorb. The serum helps your skin lock in your moisturizer. 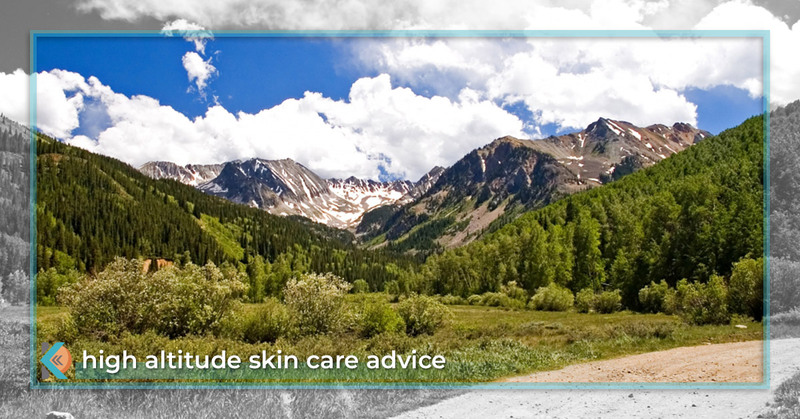 When living in higher altitude climates, your skin is particularly vulnerable to sun exposure. The best way to protect your face from sun exposure is to use a daily moisturizer with sunscreen. At Kallgren Dermatology Clinic, we carry EltaMD sunscreens, which safely provide broad-spectrum UV protection. By using zinc oxide to reflect UV rays from your skin, this sunscreen protects your skin against the sun without being irritated by chemicals. You may notice that your skin is more sensitive in our dry, sunny climate, which is fairly common. It’s a good idea to exfoliate your skin once a week, but stay away from harsh exfoliants. If your skin is particularly sensitive, you might avoid using an exfoliator altogether and stick to washing your face with a washcloth instead. However, if you can use an exfoliator without feeling tightness, dryness, or irritation in the skin, go for it. Make sure that your exfoliator is safe for sensitive skin in order to avoid scrubbing your face with an overly harsh product, which could result in redness and irritation. A healthy diet contributes to healthy skin, and certain foods can benefit your skin health. Try consuming plenty of food rich in omegas such as coldwater, high-fat fish (including salmon and mackerel), walnuts, chia seeds, flaxseeds, and more. Omegas are incredibly beneficial to your health, so you can’t go wrong by incorporating more of them into your diet. Are you experiencing skin conditions and you’ve tried everything you can think of to relieve them? Our Boulder dermatologists are happy to help. Not only do we treat a variety of skin conditions but we also offer cosmetic services such as Botox®, Juvederm®, chemical peels, and more. With several different product lines, we can also help you find the right skin care products for your skin. Contact Kallgren Dermatology today for an appointment.